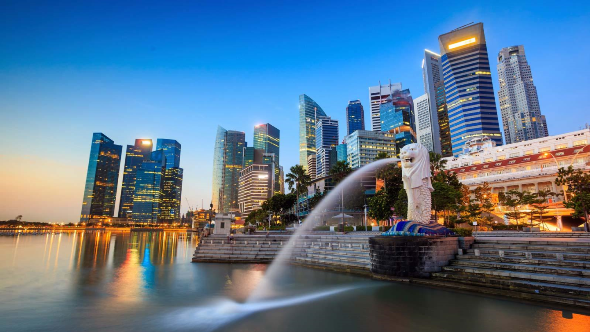 There are many tracks that students at ESSEC can attend at the Singapore campus: the Core Track, the Financial Market Track and the Global Manager in Asia are some examples. If you chose to enroll in one of them, it’s time for you to pack your suitcase and move to the other side of the world: Singapore is waiting for you! However, finding an apartment in Singapore might not be as easy. Firstly, you'll have to decide on your budget, the area that you might like (but how do you know if you’ve never been there? ), find flatmates and engage in a flat-hunting process by your own or through an agency. I have made this useful Housing Guide to clear your mind and to give you tips and tricks in order to survive a stressful flat search! The next step is deciding whether you want to tackle it personally or if you'll contact a local agent. In the first case, you’ll avoid the agent fees, but small risks linked to scams remain (although housing scams in Singapore are not very common). In the second case, relying on an agent is a great idea if you want a stress-free handling of the whole situation. Trusted agencies by ESSEC students in Singapore are OrangeTee and HSR Property Consultants among others. The agent would select some flats for you based on your necessities, and would show them on your arrival in Singapore. The downside is, you would have to pay agent fees, which usually amount to half-a-month rental for a 1-year lease or less, +7% tax (GST). I personally chose this second option, and contacted an agent on Property Guru working for OrangeTee. We created a Whatsapp conversation together with my other future flat mates, on which she often posted pictures of flats that we could have liked. We selected four and once we arrived in Singapore, we visited them together with her in one full day. At the end of the day, we decided the one that we liked and she helped us with the negotiation of the contract with the owner. The next day, we were already ready to move in! The great majority of students at ESSEC go for staying with friends or locals in a condo: a typical residential skyscraper with many amenities, such as swimming pools, barbecue pits, gym, security guards and tennis courts. Renting a flat in a condo will cost approximately between SGD4000,00 - SGD6000,00 per apartment with 3 to 4 bedrooms, depending on the location, size and condition of the apartment (prices are in local currency, Singapore Dollar). Flats situated near the MRT stations and closer to downtown (MRT Stations: City Hall, Raffles Place on the green line – see later) will cost more than the others. Internet and other utilities, around 30-50$ per tenant a month, are normally excluded from the rent, and need to be paid separately (though it depends from flat to flat!). ESSEC Asia Pacific is located at Nepal Hill and can be reached easily by MRT. 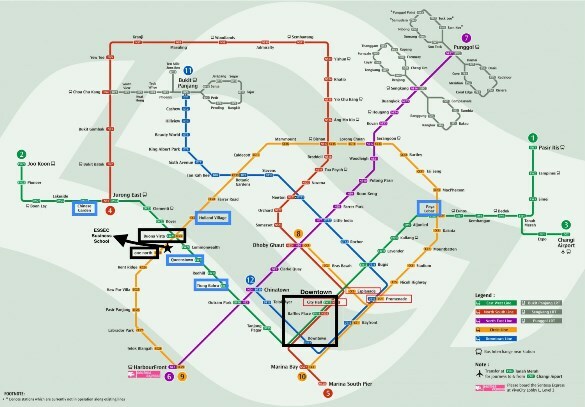 The nearest MRT stations are Buona Vista on the green line and One-North on the yellow line. There are also many bus routes that stop near the school, namely 74, 91, 92, 95, 191, 196, 198 or 200. Most of the places of interest of Singapore, as well as restaurants, clubs and bars are positioned downtown. City Hall and Raffles Place MRT stations, on the green line, are located at the heart of the city. Here you have the MRT System map. You can see highlighted in black the location of ESSEC as well as where downtown is. In blue the areas where most of the ESSEC students decide to live while studying in Singapore. In my opinion, the best compromise for you would be to live between ESSEC and Downtown, near the green MRT line. Condos near Queenstown, Tiong Barhu and Tanjong Pagar MRT stations on the green line are good choices, although they can be quite expensive. Do you want to know more about what housing in Singapore is really like for our students...? And do you want to see what the houses look like...? Then stay tuned to this blog and our Facebook page for student testimonials on housing in Singapore!